In Celebration of leadership and membership of NECDO to the WILPF in Afghanistan that was in the Head of Ms. Jamila Afghani Deputy Minister of martyrs and disabled The participants of the conference were 70 individuals who consist of women, religious scholars, civil activist, Deputy Minister, Members of WILPF, Members of the united nations, Members of NECDO, the legal staff of MOWA, officials of gender departments, teachers, students, Women’s council, Journalists and representatives of media and other individuals which belong to the governmental and non-governmental organizations. The conference was held in the Hall of MOWA on 10th Jan 2017 and was successfully completed. The conference started by the recitation of the Holy Quran by Ms. Ayesha Nizami and the national anthem by the technical team of the organization. Then, Mr. Kakar MD NECDO introduced the WILPF and welcomed the guests, followed by a demo given by WILPF members and Mr. Nazir Pazhwak, Ms. Nargis Jamal on the aims and mission of Afghanistan WILPF. Then Ms. Jamila Afghani deputy minister of martyrs and disabled talked about history of WILPF, then Ms. Aziza “Adalatkhwah” head of law at Ministry of MOWA read the Message of Ms. Dilbar Nazari minister of MOWA, then Mr. Naem Qaderi read a poem about peace, & Ms. Parina Mehrzad Deputy Director of NECDO talked about activities of WILPF during the past two years, At the end of the program Ms. Parwin dost reading the statement, the conference after the pledge and a group photo was concluded. Mr. Fazal Ghani Kakar NECDO MD welcomed the guests and talked about WILPF he said, WILPF is a non-government organization that having members many countries of the glob. WILPF since its establishment enjoined by the women from all part of the world who worked for peace, Economical, political and social justice and freedom for women. Then Mr. Fazal Ghani Kakar talked about delegation of WILPF membership and Said, we the people of Afghanistan say no to war, we are proud today that among all civil society institutions NECDO has been delegated the membership of this international movement. We are in more need for peace, freedom & development in Afghanistan, progress & development is impossible without a sustainable peace and allotment of men and women. In this regard today we don’t limit this delegation only to NECDO, this delegation is a common proud for all civil society organizations and the entire nation and all those who works for peace. Today your session is a commitment because every person work for a sustainable peace, hope this obligation be stable for each person in this community. 2: Equal participation of people in decisions, which affect their lives, must be ensured. 3: All groups, sects, factions of the society must cooperate with each other for a just, peaceful and free world. 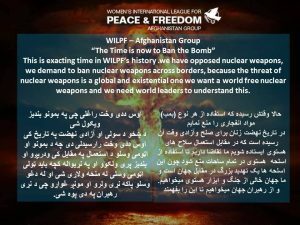 “WILPF Afghanistan groups works for Afghanistan free of war and violence, where social justice and freedom for everyone is prevailed”. We aim to bring together women in Afghanistan as peacemakers and enhance their role in the development, freedom and prosperity in order to be able to become active and constructive member of the global movement for peace and freedom. Then MS Jamila Afghani deputy minister of martyrs and disabled and the chairperson of NECDO Board of Directors talked about history of WILPF and said:’’ in 2015 attended the 100 years celebrations of WILPF in Netherland with 8 sisters that membered from several entities, this movement starts in 1915, when 1,200 women from a diversity of cultures and languages came together in Hague during the First World War, to study, make known and eliminate the causes of war. They issued resolutions, sent out delegations to most countries engaged in the First World War and created this league: the Women’s International League for Peace and Freedom (WILPF). During the 100 years WILPF was awarded with two Nobel peace prize, India more than 50 years and Pakistan more than 40 years have membership of this movement, but we women of Afghanistan don’t know about this movement, after that conference our efforts began so that we could join WILPF. WILPF works on the role of women in peace & say no to war, at the end she congratulated the membership to all people of Afghanistan, and said “we look forward to a durable and lasting peace in Afghanistan’’. Then Mr. Theodore UNAMA Senior human rights officer Talked about WILPF Afghanistan work: UNAMA has been honoured to work with NECDO on the Afghan People’s Dialogue for Peace initiative in supporting the launching of WILPF in Afghanistan, which has for the first time brought together women, men and youth to give Afghan women a fully active and participatory role in efforts to promote peace and national reconciliation. Back in 2000, the United Nations Security Council unanimously passed Resolution 1325, the landmark international legal framework that acknowledged not only the inordinate impact of war on women, but also the pivotal role women should and do play in conflict management, conflict resolution and constructing sustainable peace. The experiences of men and women in war are different. In these differences, women offer a vital perspective in the analysis of conflict, as well as in developing strategies for peace-building, by amplifying the inclusiveness, transparency and sustainability of peace and reconciliation processes. An indispensable step in working toward making women’s participation a reality has been the invaluable collaboration among the WILPF initiative, mullahs and scholars to show that Islam gives women the right to be involved in peace-building. Greater engagement with Islamic law has been an essential endeavour, not only for increasing women’s involvement in peace-building, but also for garnering support for women’s human rights more generally. Our co-operation with this effort remains a priority because it bolsters our shared objectives and supports our common human rights mission. As we begin this new year together, UNAMA stands ready to promote this work to create an environment that protects the human rights of all Afghans through a greater dissemination of Islamic scholarship and engagement with Islamic precedents with respect to women’s rights and women’s roles in peace building. As the world continues to face the uncertainty of on-going conflict, deepening inequality and the erosion of the rule of law, we must renew our commitment to the promotion of peace, prosperity and human rights. Now is the time for all of us to act in building a just, peaceful and prosperous Afghanistan, both for its citizens today and for the generations to come. On behalf of UNAMA, it is my privilege to join you here today in welcoming NECDO’s leadership and participation in the WILPF initiative to ensure women’s full participation in these efforts. Then Ms. Aziza “Adalatkhwah” head of law at Ministry of MOWA read the Message of Ms. Dilbar Nazari minister of MOWA and said: ‘’Peaceful environment is needed for women, every one should work for peace even a woman from a small village and from their families must work for peace, Afghan muslim women with careful analysis of the problems have a significant role in bringing peace, provided that the high peace council doesn’t ignore the role of women in peace’’. Then Mr. Naem Qaderi read a poem about peace, & Ms. Parina Mehrzad Deputy Director of NECDO talked about activities of WILPF during the two years. Selected the WILPF name and profile, establishment of the committees and its responsibility like Administrative & financial committee, Cultural & religious committee, Awareness & legal committee, Coordination & support committee, Media committee, control & Evaluation committee. Subsequently Ms. Zarifa sediqyan communications officer of NECDO gave information to the audience in the hall about forms and contact numbers for registration to the WILPF. Afghanistan government reiterated the 1325 action plan in 2015 but until now doesn’t have a practical commentary; we demand enforcement of the 1325 action plan. We demand the women strengthen, subscription in sustainable peace process. We demand Background subscription of women leaders as men leaders in peace negotiations process. We demand allot to the civil, human rights & women rights activities in sustainable peace process. We demand serious measures for proved of war across the country by applying of practical, real and firm mechanisms for social justice. We demand rehabilitation services and reintegration of that war affected, and asks for the restore a normal life for them. The participants was given a familiarization with WILPF and Its goal, objectives & activities in Afghanistan, and they Pledged to strive toward sustainable peace, the conference was concluded with a group photo.